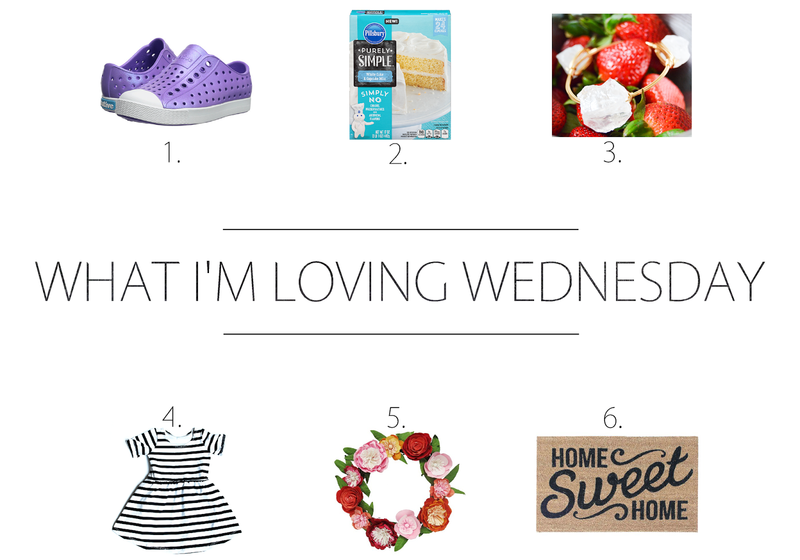 What I'm Loving Wednesday will be a great way for me to showcase some of my favorite products, tell about something fun that happened, show you what I'm crushing on, highlight some of my favorite blogs/instagram feeds and a great way for you to find all kinds of great new products to buy or people to follow! I am so excited about What I'm Loving Wednesday and it is going to be a BLAST! I hope you will follow along! How fun are these shoes? I'm planning on purchasing a pair for Bella for the spring and summer this year. I've heard so many good things about them and I can't wait for her to try them out! I'm especially loving the Jefferson Iridescence Kids shoes in Techno Purple. This cake mix tastes so good! I was recently in the mood to bake when I happened to notice this new cake mix at the store, and goodness am I glad I did. My hubby loved it even more than regular cake mixes which is definite WIN and it tasted more, I guess you'd say "real"? It didn't taste like pure sugar and artificial ingredients as cake mixes usually do. But there is a reason why! It's completely free of preservatives and it contains no bleached flour! Um, can we say Yesssssss! The only difference I noticed, besides the better taste of course, was that it didn't rise as tall as a regular cake mix, but it also didn't crack down the middle or sink after it cooled either, so that wasn't a problem at all. A short list of ingredients I can read and I'll definitely be buying this one from now on! My sweet friend Amanda who owns Sweet Tea Jewels (and also blogs over at Little Southern Life) sent me the most gorgeous bangle recently! I can't get over how beautiful and well made it is! All of the Jewelry she sells is handmade by her in the amazing state of South Carolina (helloooo future home state! ), and this particular bangle can go with just about every outfit and occasion there is! Be watching for me to wear this a lot this summer! And I think she might have started an addiction... I need alllllll the Sweet Tea Jewels now! Haha! I've been crushing on the dresses and rompers over at June & January for while now... The Swing Dresses, the Play Dresses, the Tank Jumpers... better hold them back a little ways so I don't get drool on them. Just Kidding, or am I? Hahaha. Preeeetty sure that Bella NEEDS some stat! So yeah, this wreath. I could describe my love for it with about 10 heart eye emoji, but I guess I'll use some words instead. It's simply beautiful, delicate as it's made from paper flowers and definitely worth the $20 price tag (I think anyway lol), very spring-like but I also feel like it could be beautiful all year around. It's currently hanging on our front door. This is one of my favorite finds lately. You can't beat the price at $12.99 and the style is so lovely. It instantly adds a homey feel to wherever you put it and it also makes me feel a little Joanna Gaines-ish to have this gorgeous farmhouse style piece at our doorway.